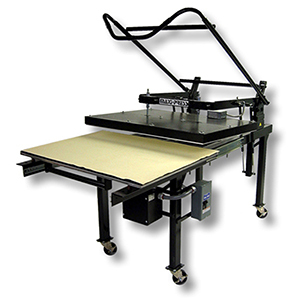 The MAXIPRESS is a multipurpose large format manual heat transfer press intended for the imprinting of a vast range of different materials. The MAXIPRESS combines an oversized platen with a low production oriented framework with a single loading table configuration. It is available in two different heater block sizes: 32" x 42" and 44" x 64". The gas shock counter springs provide a weightless and effortless operation of the press. The Digital Knight state-of-the-art control systemaccurately regulates all aspects of the electrical functions of the press, freeing the operator for the main goal of material imprinting. Ideal applications that the MAXIPRESS has performed flawlessly include: large fabrics & piece goods, full-bleed printed sportswear panels, banners, floor mats, carpets, mouse pads and more. The MAXIPRESS strongly supports sublimation transfer processes, as well as digitally produced transfers, and laminating processes.